"I have been using Pitchmark products for two seasons now and have been really impressed with everything. The paint is bright and durable and the customer service has been excellent." 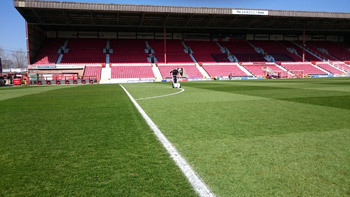 The pitch at the County Ground marked out with a Classic and Extreme. "Last year we purchased an Eco Club V2 marker and Ecoline Plus paint for the training ground and the results were brilliant. The machine was easy to use and maintain and the brightness and drying time of the paint was fantastic. We had no ghosting issues at all after mowing or play." "We have been that impressed with the spray setup that we will be using it this season in the stadium when weather conditions are tough and we need the paint to dry quicker than usual. "